In a large bowl with electric mixer beat SunButter®, sugar and oil until smooth. Add egg and milk and continue beating until smooth. Add flour, baking powder and salt and blend by hand with whisk until smooth. Ladle 4 to 5-inch circles of batter onto heated griddle and cook until bubbles start to form on surface of pancake, then flip. Cook second side until golden brown. Remove to plate and cover to keep warm until all pancakes are cooked. While pancakes are cooking, prepare Velvet Cream. Beat softened cream cheese with hand mixer until light and fluffy. Add SunButter® and continue beating until combined. Slowly add powdered sugar and continue beating until smooth. In separate bowl with clean mixing blades, whip heavy cream and vanilla until soft peaks form. Gently fold whipped cream into SunButter mixture. 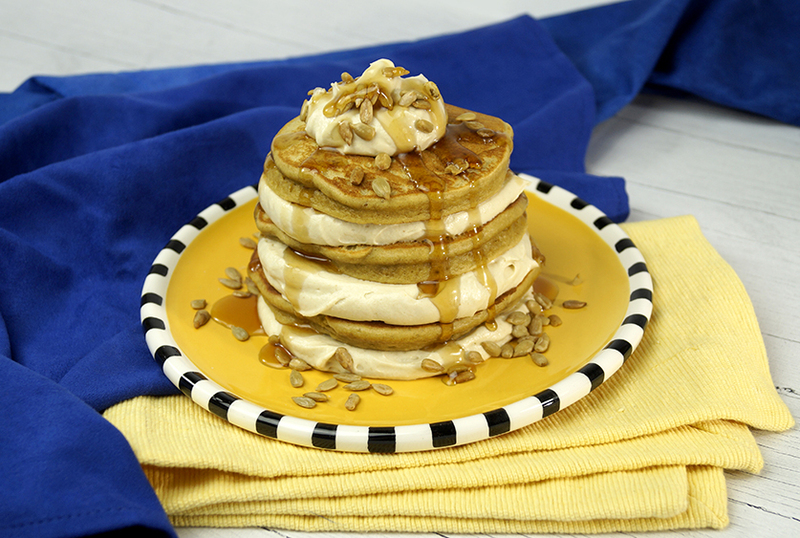 Assemble stack of 3 pancakes with cream in between each layer and a dollop of cream on top. Garnish with roasted sunflower seeds and maple syrup if desired.